As most SEGAphiles like to boast, the Dreamcast had one of the best libraries for any game system ever. 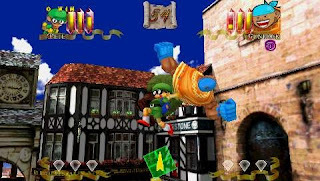 Part of the reason for this is at the time the console came out it has a wide variety of games that are considered niché by today's standards. The fighting game genre was the apex of this, with Marvel vs. Capcom 2 being the title people most fondly remember. While this genre brought many great game in this segment of the console wars (include my favourite: Garou: Mark of the Wolves) it was a genre that very rarely innovated. This isn't a bad thing, Street Fighter II is engaging as ever and so are all of the games that emulated it but there is wriggle room for innovation. To name a few games off the top of my head, Bushido Blade was one of s few games to try and stretch this idea forward (and one of even fewer games that succeeded at it's goal) and Super Smash Bros provided the Nintendo-fication of the standard genre model. 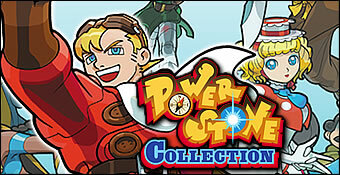 SEGA would try their own hand at SEGA-fying the genre with the Power Stone series, now available on the PSP. 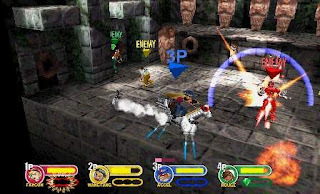 The gameplay of Power Stone is likely to strike some chords with anyone whose played Super Smash Bros. Melee (even though that game was released after the Dreamcast originals). Continuing with the Smash Bros. analogy each stage takes place in a 3D arena. Each characters move list gives you a rather small array of moves to work with, about as many as your average beat em up. The key to success is embracing the games destructible environments and using them against the opponent. In short, anything that isn't nailed down to the floor (and a few objects that ARE nailed down to the floor) can be used as a weapon. None of this mentions the titular Power Stones in question. During gameplay, gems will randomly spawn around the arena. Collecting all three of these gems will make that character go into their super mode which games the player a tactical advantage. If you've played Super Smash Bro.s Brawl then you'll know how this works as it's exactly the same mechanism for the Dragoon parts, except you're rewarded with a final smash state rather than an instant kill weapon. Power Stone 2 added new characters and scrolling stages that made the game a bit too chaotic for its own good, although the fun core gameplay is still retained. The PSP port of this adds slightly better graphics and more features to the sequel but this adds severe loading times that are bad even by PSP standards. Looking at the prices for the original games (especially the sequel), it's still an amazing deal no matter which way you look at it. Its simplicity and focus on slapdash fun rather than complex mechanics does mean that the game can get boring after a while (no worse than Smash Bros.) but it brings two great games to the PSP at a low price and it worth waiting ten seconds for what most people have been waiting an entire lifetime to play.